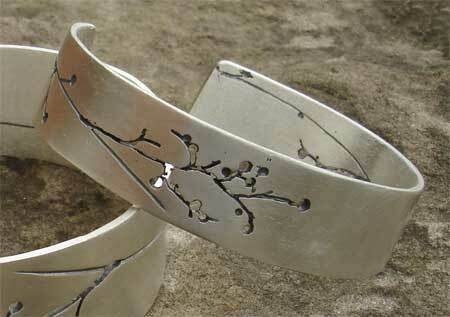 Floral Designer Silver Cuff Bracelet : LOVE2HAVE in the UK! 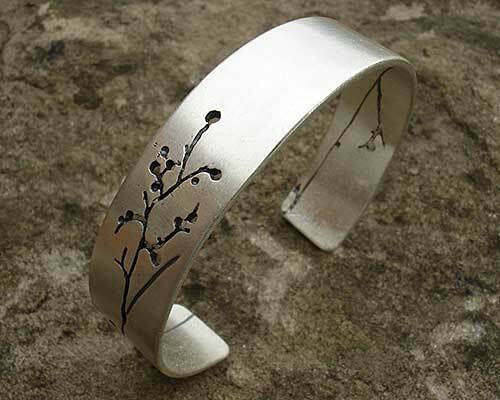 This women's handmade sterling silver cuff bracelet has a floral design which is depicted cleverly by the use of cut out oxidised detailing portraying nature and growth in the form of branches with springtime buds. The designer styling to the cutouts has a superb artistic interpretation, and the blackened areas highlight this concept. The bracelet has a nice generous width of 15mm so looks great on the wrist, and it comes with a steely matt finish. It fits wrist sizes 5 inches to 7 1/2 inches, measuring 65mm in the inside diameter. Size(s) Available: 5 - 7 1/2 inches as standard.